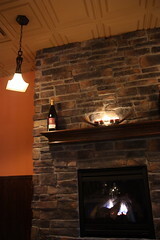 This week we had the opportunity to check out Ryan's Bistro before their official opening on November 24th. Ryan's Bistro is a new restaurant that has quickly taken the spot of the former OMai Vietnamese Restaurant. The Ryan in question is Ryan Gish of Prestige World Class. A couple of days after our meal, I called Ryan to ask him about the opening and how things were looking. In our conversation, he stated that things were running well and he considers the place officially open, with the exception of this Sunday when they'll be closed for the day. He said the feedback so far has been "extremely positive", noting that people have really enjoyed the atmosphere which he described as comfortable and cozy. I have to admit, the place looks far different than the previous three restaurants that occupied that location. As for the food, there is a good mix of selection with some small twists to peak your interest level. Since this is a preview, not a review of Ryan's Bistro, I'm not really going to critique our meal there. For the most part, I'll let the pictures speak for themselves. I will let you know, however, that we'll be back. That said, we did have some serious service issues, but those can easily be resolved; Dario's Brasserie is proof of that. When I brought those issues to Ryan's attention in our phone call, he mentioned that several parties RSVP'ed at the last minute which left them short staffed and it was their first night serving large parties. Like I said, something that is easily resolved. Just be aware that they may not have all the kinks worked out right away. If you do go, be sure to let us know your thoughts. If you'd like to be on their mailing list, you can do so on their website.